Orkut founder is Back; Launches ‘Hello’, an Interest Based Social Network! Orkut was one of the first social networking sites that focused on finding new friends online, and sadly it closed down in 2014 when Facebook snatched nearly every person from it. Facebook was new and fresh and Orkut was becoming a little old and boring then, with a community of 300 million users. After almost 12 years of Orkut’s inception, Büyükkökten has launched Hello. According to him, Hello is the successor to Orkut, and Büyükkökten calls it the next generation of Orkut. On Orkut, you could have fan clubs and groups just like Facebook now, but Hello goes a step ahead and introduces to people who love to do what you love to do as well. You might be wondering, why Hello? When other companies are coming up with fancy names like Snapchat, Instagram, Telegram and Pinterest etc, how will Hello stand with them? Büyükkökten has a very simple answer to this. The first thought that came to mind when I read about Hello was “How will it differentiate itself from the other thousands of social networking sites we have?” and the answer lies in the fact that you will see content from people who share the same interests as you. The good thing about the service is that it only uses your contact list to find people. So it is a good way to know your contacts better, considering over 80% of your contact list is full of people you usually don’t know much about. When you sign-up on the app, you have to list down five interests, or ‘personas’, which will help you explore people with similar tastes. Your contact list and your preferences will decide what you see on your news feed, much like Instagram and Facebook. The algorithm searches for people with similar tastes and promotes them on your feed, also suggesting your friends you can add, called ‘potentials’. Just like Instagram, you can add photos and images to your profile, called ‘jots’ with filters and share them with others. As your create more connections and contribute more to the communities online, you climb up the leaderboard with points, called ‘karma’, with some lucrative rewards and gifts. Uptil this point, everything is quite unique. However, it shows a lot of resemblance to Pinterest, which also offers interest-based social networking. However, Pinterest is more of idea sharing, while Hello will be a mix of Instagram, Facebook and Pinterest. Will it be able to counter the leaders? Considering the fact that we’re already in a deep pile of social networking sites, we do not require another one. Facebook owns Instagram and both have a seamless integration with other social networks as well. Do we really need another social networking site now? We’re already very closely connected with people through WhatsApp, Skype, Facebook and Google+ that we don’t need another service to remind us we need to make more friends and see the world around. Orkut was one of its kind back then, but Hello is almost like every other website out there now, so even though it does distinguish itself it some ways, it might not be able to attract a lot of people. However, it is never too late to start a venture and Hello might just become a hit with the younger Tinder-generation. 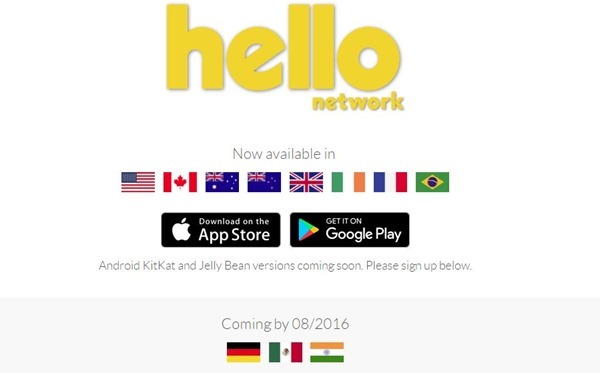 Hello is an app only service available on both iOS and Android, starting from countries like Australia, Brazil, Canada, France, Ireland, New Zealand, the U.K. and the U.S. Hello will also come to Germany, India and Mexico by the end of this month. "Orkut founder is Back; Launches ‘Hello’, an Interest Based Social Network! ", 5 out of 5 based on 10 ratings. So basically he is launching his own Reddit.